What is Halotherapy/Salt room therapy? Salt therapy, also known as Halotherapy is a drug free, non invasive treatment that alleviates the health problems associated with asthma, sinusitis, allergies, and a host of other respiratory illnesses. In 1843, a Polish doctor, F. Botchkovsky was the first to discover that the environment inside salt mines had a therapeutic effect on respiratory diseases. Many salt mines in Eastern Europe were used as medical resorts for patients with lung diseases. Speleotherapy, as it came to be known, became a conventional, effective, and drug free method of treatment for respiratory illness in Eastern Europe and Russia. In the 1980’s, artificial salt caves were developed by lining rooms with salt bricks or blocks. Research carried out in these rooms did not replicate the curative atmosphere of the salt mines or caves. Scientists came to the conclusion that the main therapeutic factor of the salt cave micro climate was dry aerosol of salt in combination with stable humidity and air temperature. With this knowledge, in the early 1990’s, Halo generators were developed in St. Petersburg Russia. Halo generators blow dry aerosol of salt into enclosed rooms that replicates the micro climate of natural salt mines and caves. Following are the common respiratory illnesses that are greatly improved by salt therapy: asthma, sinusitis, bronchitis, cystic fibrosis, chronic ear infections, allergies to dust, pollen, pets, and chemicals, hay fever, smokers cough, chronic cough, sore throat, nasal congestion or runny nose, snoring, recovery after acute pneumonia, and chronic rhinitis and tonsillitis. It may also help sleep apnea depending on the cause. In addition to helping with respiratory illnesses, it can also help many common skin diseases including: eczema, psoriasis, and acne. Salt therapy also promotes stress reduction, which can lower blood pressure, and help with insomnia. 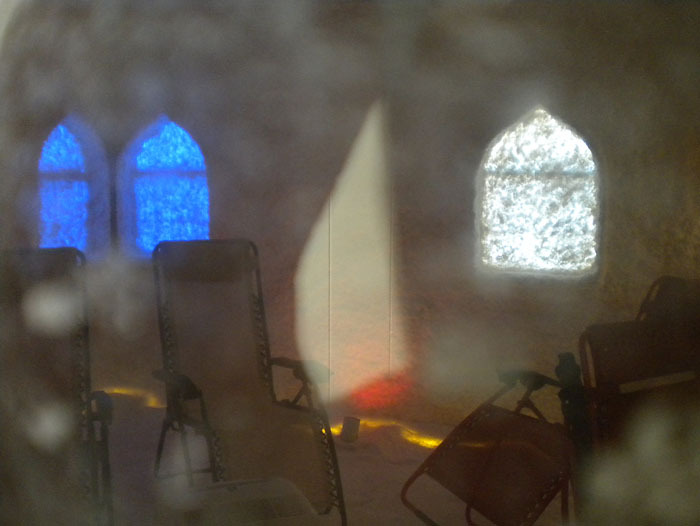 Salt therapy can help prevent respiratory viruses, including the common cold and flu. Children and adults who experience chronic or multiple colds throughout the year due to day cares, schools, or poor ventilation in the work environment can benefit greatly from Halotherapy. Halotherapy is 100% natural, safe, and drug free, providing effective long-term relief. It can be used as a complementary treatment to prescribed medications or as a sole treatment. When Halotherapy is used as a complementary treatment, it can increase the effectiveness of prescribed medications and decrease the amount prescribed. Halotherapy works exceedingly well for children. A typical salt therapy session lasts for 45 minutes. You will be asked to wear disposable foot and head covers that will be provided. 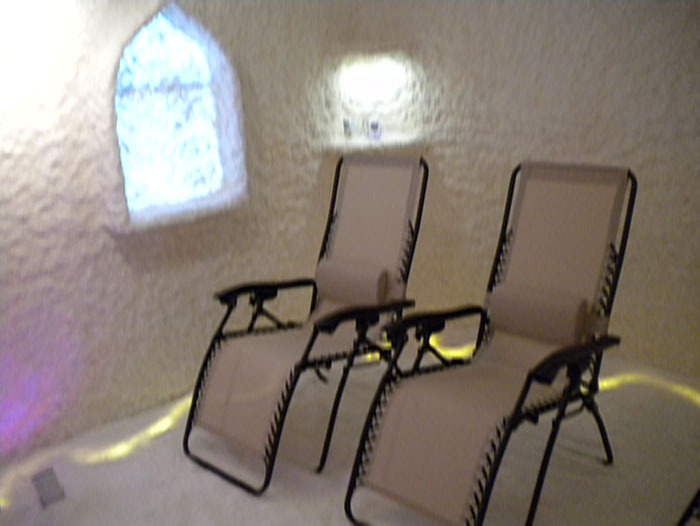 The therapy involves sitting in the salt room in an adjustable and comfortable lounge chair. Children will be allowed to play on the floor with the salt and toys. The lights will dim and you will hear relaxing music. The room temperature and humidity is maintained at a comfortable level. Most people like to close their eyes, and some will fall asleep or meditate. A change in lighting will alert you that the treatment is over. Yes, Halotherapy has been well researched in Russia and Eastern Europe. Most of the research has been conducted by Dr. A. V. Chervinskaya, the head of Clinical Research Respiratory Center in St. Petersburg Russia. She works in the field of pulmonology and rehabilitation medicine and has published more than two hundred articles on this topic. Recently, the New England Journal of Medicine published an article on the efficacy of saline salt therapy in cystic fybrosis. They found that long term saline salt treatment had a positive impact on lung function and reduced pulmonary exacerbations. In addition, they found no negative side effects associated with the therapy. Please go to our research page for more information.